With a foreword by Open champion Ian Baker-Finch, Australia’s Finest Golf Courses is a magnificent tour through Australia’s best golf courses, from the timeless classics at Royal Melbourne, Kingston Heath and Royal Adelaide to the modern masterpieces at The National, Kennedy Bay and The Capital. There is also a rare and fascinating look at the country’s most exclusive golf course —Ellerston —designed by Bob Harrison and Greg Norman and located on the Packer family estate in the New South Wales Upper Hunter Valley. The book presents state-by-state reviews of our finest courses, covering both history and design, and accompanied by superb photography and course comments from leading designers including Greg Norman, Peter Thomson, Bob Harrison, Ross Watson, Michael Clayton, Tony Cashmore and Michael Wolveridge. The book also includes a foreword by 1991 British Open champion Ian Baker-Finch and a ratings section that details the best golf holes and courses, both classic and modern. RRP $34.95 - Available from good book stores in Australia. 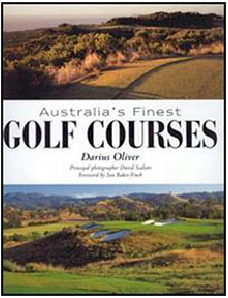 Australia's Finest Golf Courses is a wonderful celebration of our golfing heritage from MacKenzie to Moonah by Darius Oliver. Oliver’s examination explains just why each course is special; with historic notes on the classics and first hand information from the great designers of the modern era from Thomson and Wolveridge to Baker-Finch, Norman and Harrison (including their stunning work for Kerry Packer at Ellerston) and Cashmore. He is also unafraid to criticise where course reworking has destroyed character, or created penal or boring holes. Although I’ve played most of the 50 courses several times, Oliver’s book provides special insights that will enable me to discover added pleasure on future rounds. A wonderful inclusion in the book is a section wherein Oliver rates not only the courses, but the holes, presenting lists such as “Best Set of Par Threes – Modern”, “Best Par Fours – Classic (under 340m)”, “Most Spectacular Holes”. The colour plates by Australia’s foremost golf course photographer, David Scaletti, and others enhance the presentation.